One of the most comprehensive, aesthetically pleasing closet systems available today is the White & Birch Small Elfa Decor Reach-In Closet. 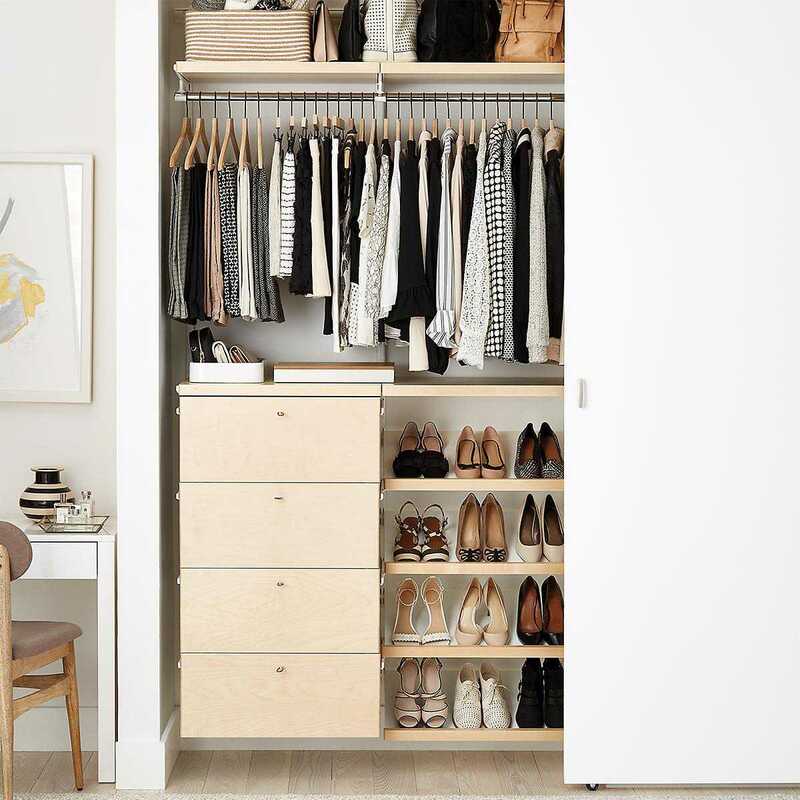 This solution is designed to fit in a reach-in closet at least 50” wide and around 96” tall, and it comes with everything you need to organize your wardrobe. When assembled, this closet system has two high shelves with rods underneath where you can hang your clothes. There are four drawers for your undergarments and other folded clothes, as well as four angled shelves where you can line up your shoes. The top track is the only piece that needs to be mounted to the wall, making it easy to install, and the drawers and shelves are made from beautiful birch wood for a luxe, high-quality finish. If you’re looking for a beautiful, highly functional, and durable closet system, this option for Elfa will maximize every inch of your closet space. For a basic, affordable closet system, one top-rated option is the ClosetMaid White Custom Laminate Closet System Organizer. It may be a budget option, but this product is versatile and functional, making it an unbeatable value. This closet system expands to fit in reach-in closets 4’ to 9’ wide, and it is 83” tall. The unit comes with six open shelves made from durable laminate, and it features three closet rods that expand from 30” to 48”, allowing you to custom fit the system to your space. According to reviewers, this ClosetMaid Closet System is fairly easy to install and greatly increases the hanging space of small closets. Overall, most agree it is a worthwhile investment, especially for the low price. No room for a dresser in your bedroom? No worries. The Martha Stewart Living Classic White Ultimate Wood Closet System Kit comes with several built-in drawers that will allow you to store folded clothing right in your closet. This closet system is 96” wide and 72” tall, and it gives you ample hanging space, as well as a variety of storage options like shelves and drawers. There are four separate rods to hang clothes, as well as four drawers and three shelves. The unit is made from a durable, scratch-resistant melamine surface, and it comes in both white and faux wood finishes. Some customers did note that this closet system arrived damaged, forcing them to wait for replacement pieces, but those that have installed the system say it’s versatile and sleek. Trying to fit your whole wardrobe into a small closet may seem like an impossible task, but the Platinum Elfa 3’ Reach-In Closet will make the job a little easier. This highly-rated closet system will let you make the most of every square inch, providing a spot to store every possible item. This Elfa closet system is designed for spaces at least 38” wide and 88” tall. It features several metallic closet rods, plastic sliding bins, and a number of metal shelves where you can stash shoes, bags and other essentials. The top track is the only piece mounted to the wall, and the entire unit is made with epoxy-bonded steel to ensure it lasts for years to come. Reviewers say this closet system is easy to install and note that they’d happily purchase this unit again. If you’re lucky enough to have a spacious closet, you need a big closet system to help keep the space organized. One great option is the ClosetMaid Suite Symphony Closet System, which can be expanded to fit closets up to 10’ wide! This product comes in a variety of configurations and finishes, so you can pick the one that best suits your needs and style. It fits closets between 7’ and 10’ wide, and it’s made from durable laminated wood. This particular model comes with eight shelves, four drawers, three closet rods, and two doors, and it must be mounted to the wall of your closet. Reviewers love that this unit is easy to assemble, provides ample organizational space, and looks sophisticated. However, several do note that the materials are not very durable, but it will still get the job done. As covetable as they are, walk-in closets present their own set of challenges—namely, how to best organize the large space and keep it from getting cluttered. Luckily, the Container Store offers an amazing closet system with the Platinum Elfa Walk-In Closet, and they’ll tailor it to your specific space. While certainly not cheap, this closet system will help you organize your walk-in closet in a way that’s functional and convenient, and it includes everything you need to properly store your wardrobe. There are both long- and short-hanging rods, mesh drawers in 18" and 24" sizes, gliding shoe racks and plenty of additional shelving space. The solution is best for a 6’ by 8’ walk-in closet, but the pieces can be arranged in an infinite number of ways, ensuring they’ll fit your space. Reviewers can’t say enough good things about this closet system, writing that it provides more storage space than they ever expected and it looks beautiful too. Looking to streamline your child’s reach-in closet? Then you’ll definitely be interested in the Little Seeds Grow With Me Closet System, which is affordable and perfect for growing kids. This adjustable-width closet system fits in spaces between spaces roughly 5.5’ and 8’ wide. It includes a center shelving and drawer unit made of white particleboard, as well as several adjustable rods and a shoe rack. Reviewers say this unit can be a little complicated to put together, but most agree the finished product looks polished and is a perfect storage system for children’s closets. If you live in an apartment, you might not be able to install a closet system that mounts to the wall, but that doesn’t mean you can’t organize your belongings. The Trinity Chrome Expandable Wire Closet System Organizer is a top-rated freestanding option that will give you the freedom to store your wardrobe in a neat, polished way. This unit is best for closets between 56” and 78” wide, and it stands at 84” tall. It comes with two freestanding metal towers, as well as 10 bamboo shelves that you can place where you want. Then, you simply hang the adjustable closet rods between the two towers to hang up your clothes. Online reviewers say that this product is sturdy and versatile, and for larger closets, you can buy more than one and set them up next to each other. Even better, this closet system is designed to be easy to put together, taking just 20 minutes to install.